Hey everyone! I don’t know about you, but this weekend was definitely a full, yet very fun one! Saturday we celebrated my besties upcoming wedding with a fun bachelorette party! We went out to a fun local restaurant before heading back to the maid of honors parents house where we played games and opened presents. We played this funny game of telephone Pictionary-bridal edition. Things got hilarious pretty fast between the drawings and then interpretations of them! How the game works for those who haven’t played it before is everyone is handed a certain amount of papers. You write a phrase on the first page, in this case something connected to the wedding like bouquet toss, and then you pass it to the right. You then look at the phrase the person just wrote and flip to the next page and have to do a drawing of it before passing it to the right again. After this pass you’ll have a picture that you then have to try to guess the phrase before passing it to the right again and it continues in repeat like this until you run out of pages. Then you get to see just how far you have come since the original phrase which can have you in stitches with laughter. If you follow me on Instagram and watched my Instagram story you know that Saturday morning I realized I was out of wrapping supplies so I had to run to Target to pick up some fun wrapping supplies. 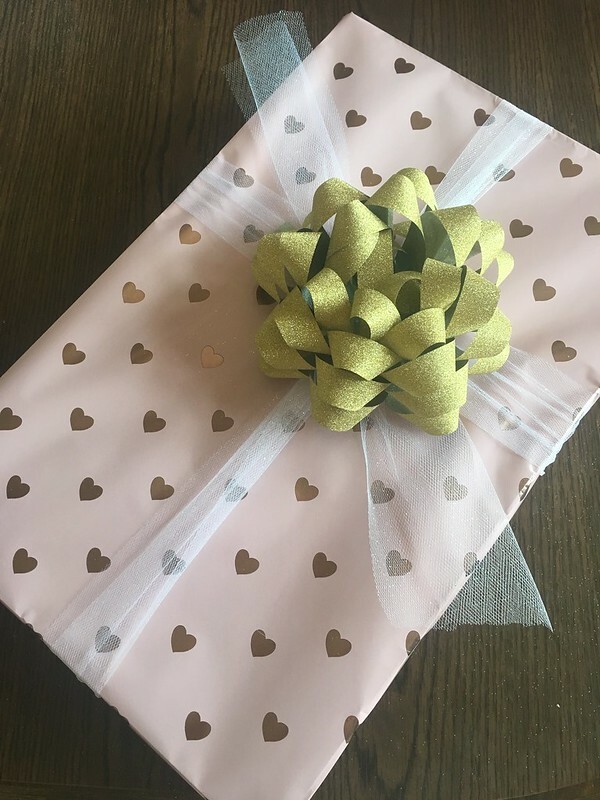 it got me to thinking that I would share with you how I like to wrap presents as well as what I like giving to a bride at a bachelorette party! Of course when you go to a bachelorette party you want to bring some lingerie, so for this particular one I found this beautiful robe that was just perfect. 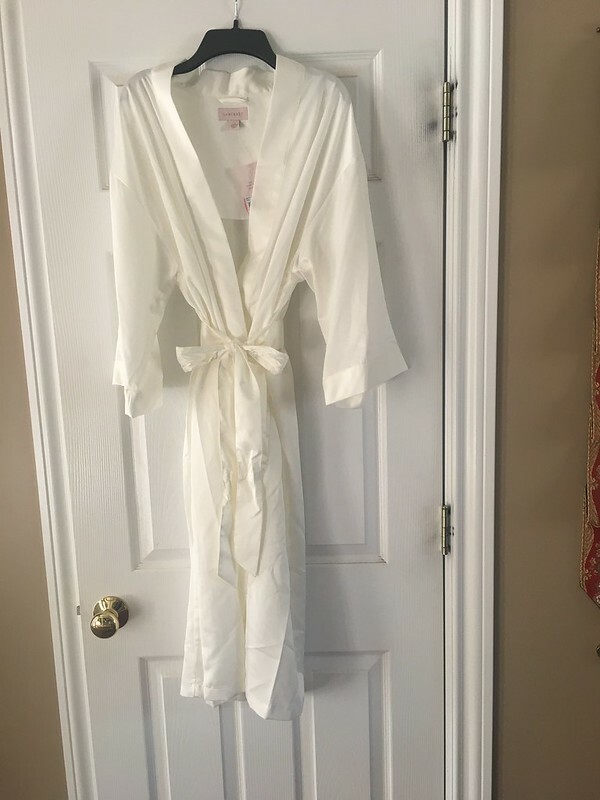 I knew that most people would be taking care of other fun things, but every bride needs a beautiful robe that she can wrap up in, so when I found this beautiful satin one I knew that it was just perfect, and how better could it have been since it was white? This next little bit is just something fun that I like to do since I enjoy themed presents. I love throwing in a few little knick-knacks for the bride that are bridal themed that she may not buy for herself otherwise. 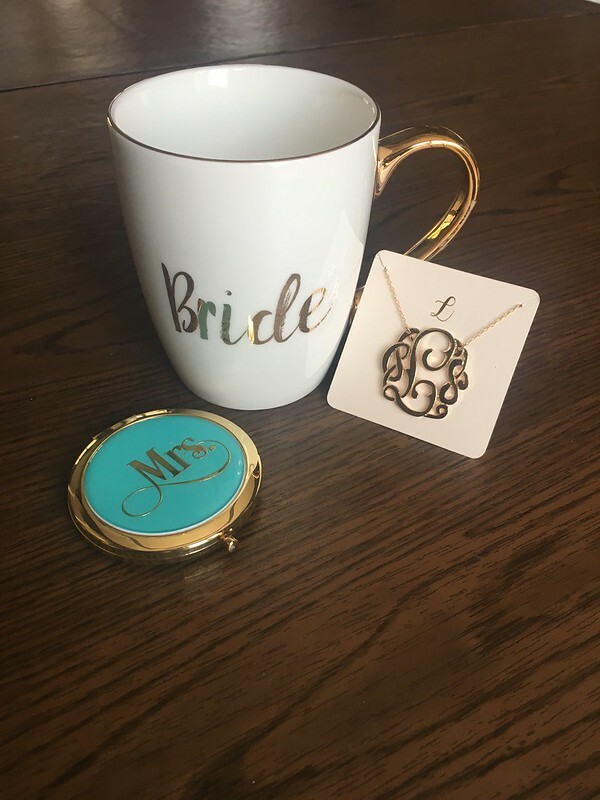 In this case I found an adorable compact mirror that said MRS. on it, a coffee cup that said Bride, and a monogrammed necklace with her new last initial on it. While nothing fancy, they are just some fun things that she can enjoy as she is entering into this fun new phase in life. 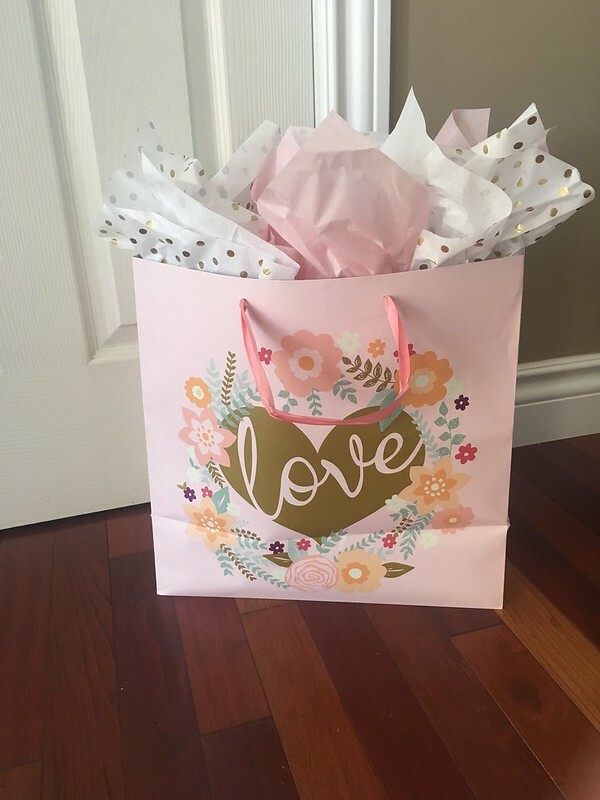 I am a huge fan of pretty presents, so my secret is choosing a theme, then finding a bag, wrapping paper, bows and tissue paper that match, then using all the above liberally. Here inside the box I wrapped the robe, mirror and necklace inside tissue paper before wrapping them inside the box. I was going to put the mug inside the box too, but it didn’t fit so I had to wrap it separately and put it into the bag. I then place the box inside the bag with the remaining tissue paper and a card. The reason I like doing the box inside a bag is because, a) boxes are more fun to unwrap and b) bags looks so pretty with tissue paper and are easier to carry to parties or showers. And truthfully, I do all the bows and tissue paper also because I love making a present look pretty. I’ve never forgotten how at my graduation a friend of mine gave me a present that was wrapped beautifully and the fact that she had taken the time to make even the wrapping look so pretty made me feel special. After that experience I’ve tried to make presents that I give to other people look pretty as a way of trying to share with them just how special they are to me too. Well, now that I have told you my secrets, what do you like bringing to bridal showers and bachelorette parties? 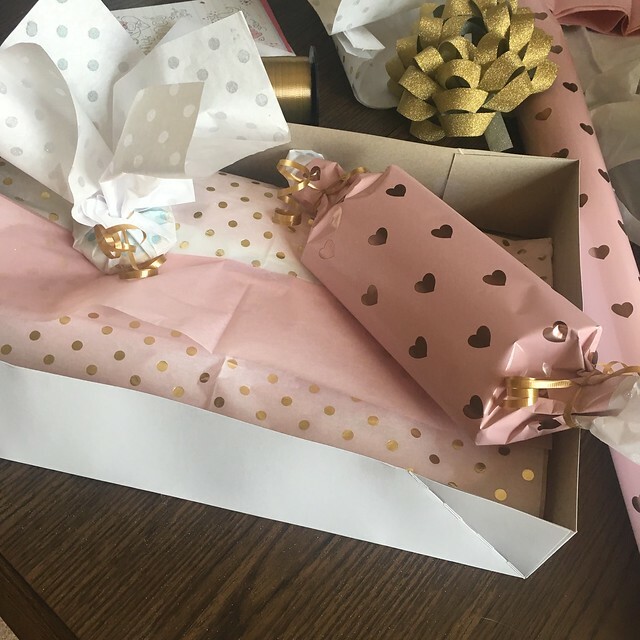 Does anyone else really get into giving pretty presents too?